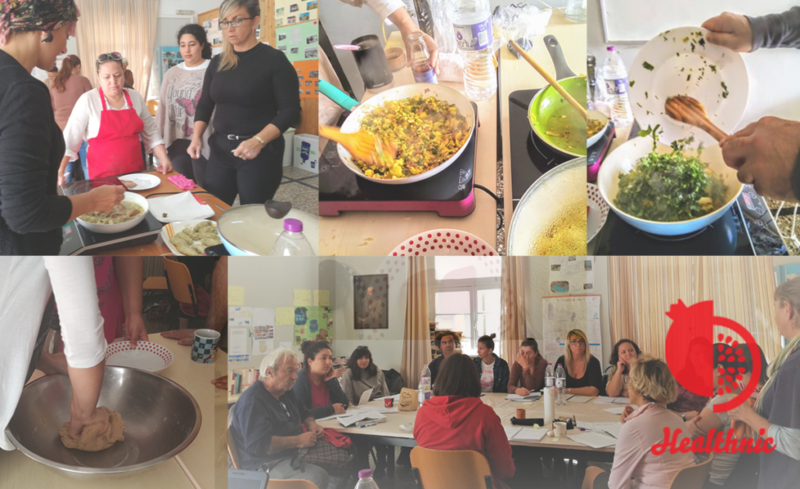 The Vardakeios School started its local Healthnic workshop on the 16th of October and closed the cooking part of the seminar last Thursday, on the 15th of November. The participants of the workshop is a mixed group of 16 immigrants and local unemployed people consisted of people coming from Albania, Argentina, Egypt, Hungary, Poland, and Greece. The sessions were held twice a week for 4 hours each time. Through experiential activities, the group used their memories, acquired habits, personal preferences and cultural elements all related to food in order to approach food culture in a more interactive way. The facilitator of the workshop, Maria Krina, used this process as a vehicle to create a strong bonding between them but also to show them easy ways for nutritional yet multi-collective diet. What remains as a feeling from all the people involved in this undertaking is the optimism that people can always find ways to connect with each other especially when they collaborate in issues such essential as food. Creating, sharing, feeling, tasting, learning together was a beneficial and inspiring process that keeps on giving meaning to our everyday life. An experience that helps us come together with people we think as “strangers” in a respecful, collaborative and creative way. During the first two workshops, we worked on getting to know each other and creating a bond by sharing personal information and baking bread together. All different cuisines started to unfold their secrets allowing us to talk about seasonal products, wholemeal grains and their importance for a healthy diet. We embarked on a journey into time sharing memories and understanding that each dish is the mirror of the history of the land and its inhabitants. The group expressed a strong need for learning more about healthy eating, so during the workshops this week, we talked a lot about ways that can help us change our diet and establishing more healthy habits. We recorded our weekly menus and started thinking of the changes we would like to make. We talked about the importance of water in our diet and watched a short film about Dr. Masaru Emoto’s water experiment. But since cooking is the issue and the joy we improvised integrating all the different cooking ways and newly acquired knowledge and made salads using buckwheat, millet, lentils, and fresh vegetables and talked about the importance of the six tastes. We started by cooking different pumpkin pies and learning to roll the dough. Filo in Greek! We shared different recipes and from those countries that have no such tradition, we used dough recipes changing them in order to be healthier using whole meal flour and less salt. While waiting for the pies to bake we did a new healthier weekly menu and each one made a self-contract about the changes he or she wanted to make. We decided to make our own water experiment energizing personal water bottles using the words LOVE and HEALTH. Then we created six new recipes, which, while integrating all cooking traditions, had a more “Greek” flavor. We cooked the recipes of the previous week. ● Stuffed zucchini with herbs and a traditional Albanian sweet dish with wholemeal rice long forgotten even in Albania with a Greek touch. ● Lentils “giouvetsi” with wholemeal pasta in the oven and lentil salad in a Greek – Hungarian way. ● Cabbage with rye and herbs and “politiki”, cabbage salad with a lot of Egyptian and Polish influences. Herbs and spices appeared on our tables and new knowledge about their uses together with the magic of their aromas made our day! We shared stories the aromas brought up and had a lot of fun together with a bitter-sweet sentiment of nostalgia. We cooked the leftovers of the ingredients improvising with a stronger touch of herbs and spices, as we never had food leftovers! Each dish had its own unique spice mix each group created that made the difference. We came up with easy, healthy solutions about shopping and cooking fast and easy nutritious dishes. We looked at our contacts to see how we are progressing and we all did well. We were all very supportive of each other, making jokes about the difficulty we all have to change. We set a date for the next meeting around the table sharing what all will cook at home. So we will start working for creating the digital stories in a warming, festive way eating food cooked with love and lots of new knowledge. The digital storytelling part will follow for the next three weeks with meetings once a week where the participants will have the chance to create their own digital stories related to food.